As its name suggests, Iceland is perhaps the best place on the planet to experience the sheer might of a glacier. 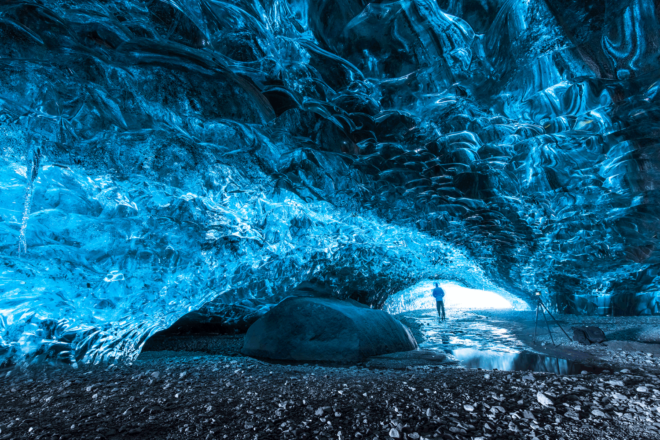 The ice cave pictured here is found in the easy-to-pronounce Svínafellsjökull glacier, part of the Vatnajökull National Park, which is the largest ice cap in Europe. Glowing with a translucent blue, the caverns are referred to as the Crystal Caves. As centuries-old ice reaches the bottom of the glacier it becomes completely clear as immense pressure forces the air bubbles out of it. If you’re lucky, heavy winter rains will have washed away the snow off the top of the glacier, allowing light to penetrate deep into the cave below resulting in a majestic, sapphire-blue tunnel. The best time to visit these natural wonders is in the Icelandic autumn and winter when the ice becomes stable enough to explore safely.